I have always been a fan of pineapple salsa. It’s such a tasty treat and something me and my sister have always enjoyed eating. 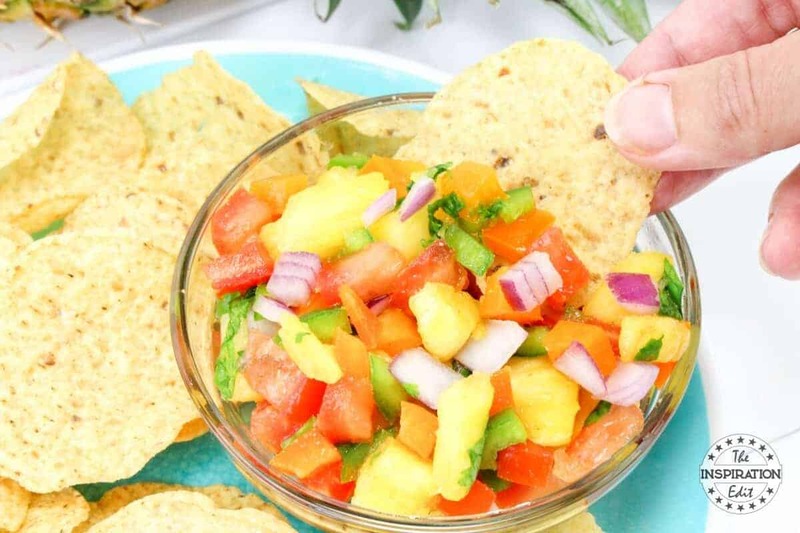 In fact you can make this Salsa recipe easy and it’s a great snack and the type of salsa that is perfect for nibbling on during a family get together. 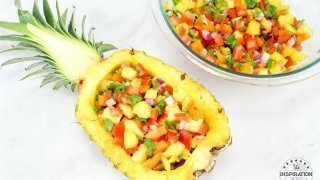 What Vitamins Can You Find In Pineapple Salsa Ingredients? 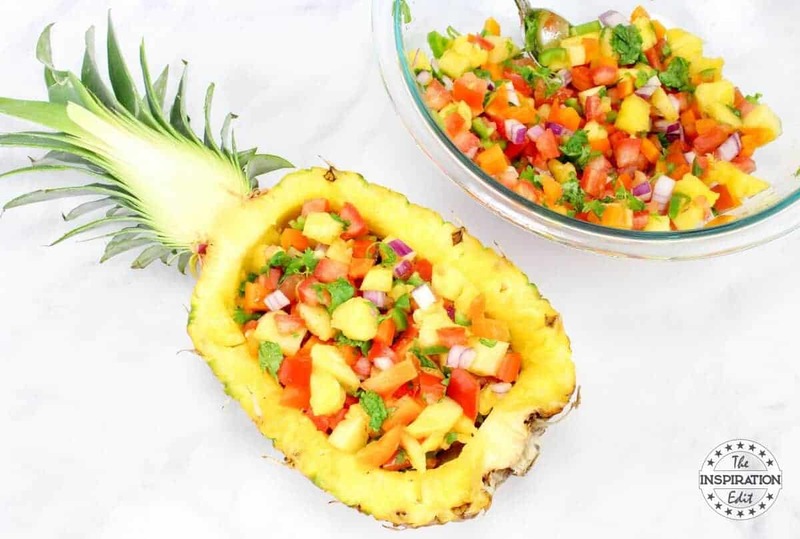 This recipe has Vitamin A, B6, B12 & D. The Pineapple Salsa has Iron, Magnesium and Calcium and the Pineapple is full of Antioxidants. This Salsa could go really well with a packet of low point crackers, snacks or lentil crisps. 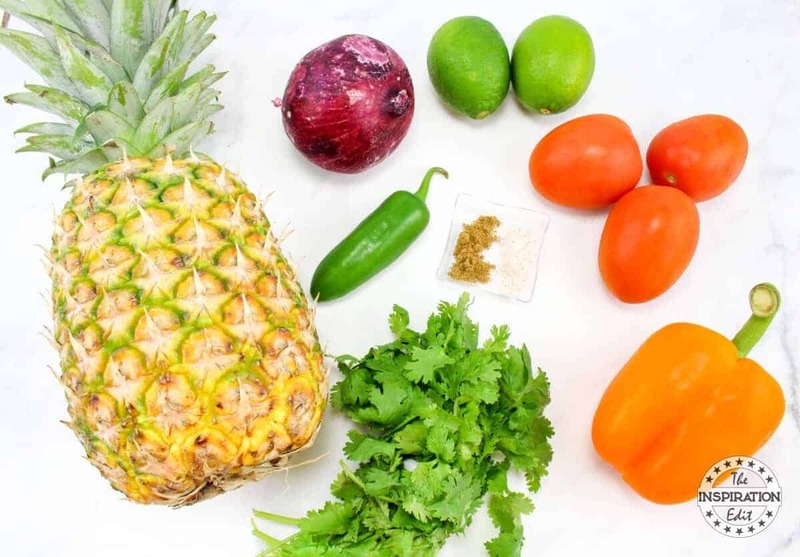 Here are the salsa ingredients that you will need. Cut the pineapple down the center lengthwise so the stem is also cut down the center. Do this carefully so the stems stay attached to each half. Cut a grid pattern of squares into each pineapple half making sure not to cut through the rind. I left about an inch of pineapple around the edge of the rind. 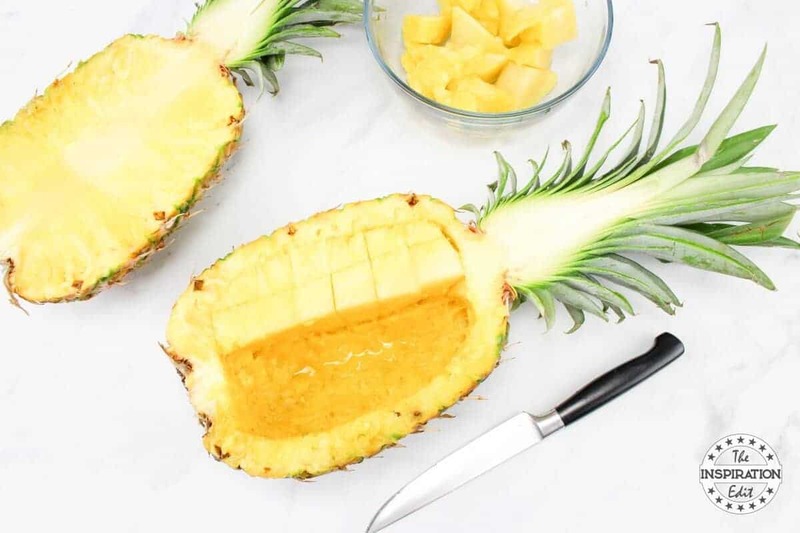 Dig out the pineapple chunks and chop them into very small chunks. Put them into a large bowl. 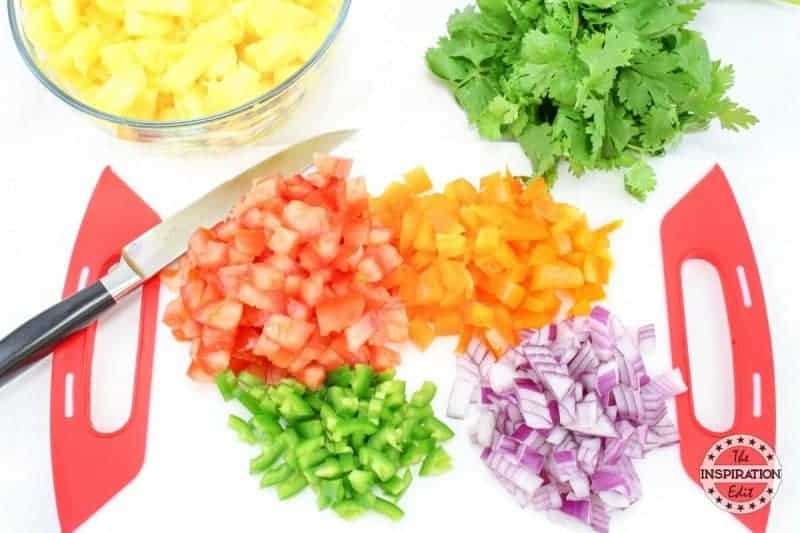 Chop the tomatoes, onion, orange pepper, and jalapeno pepper into small pieces. Put those in the bowl with the pineapple. Chop a small bunch of cilantro and put that in the bowl along with the salt and the cumin. Gently mix everything together and squeeze the juice of one or both the limes over the salsa and mix again. 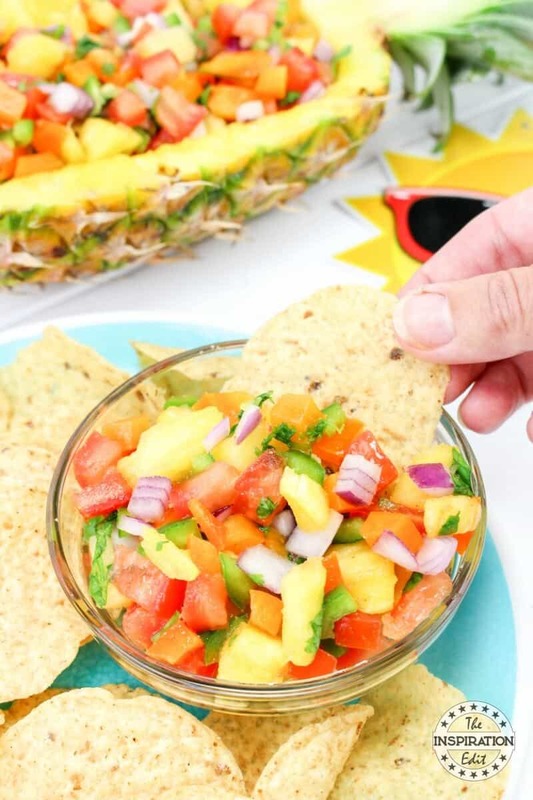 Add salsa to the hollowed-out pineapple halves, then serve with tortilla chips. 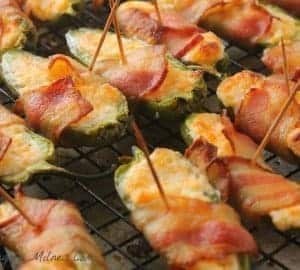 Delicious summer snack or light meal! 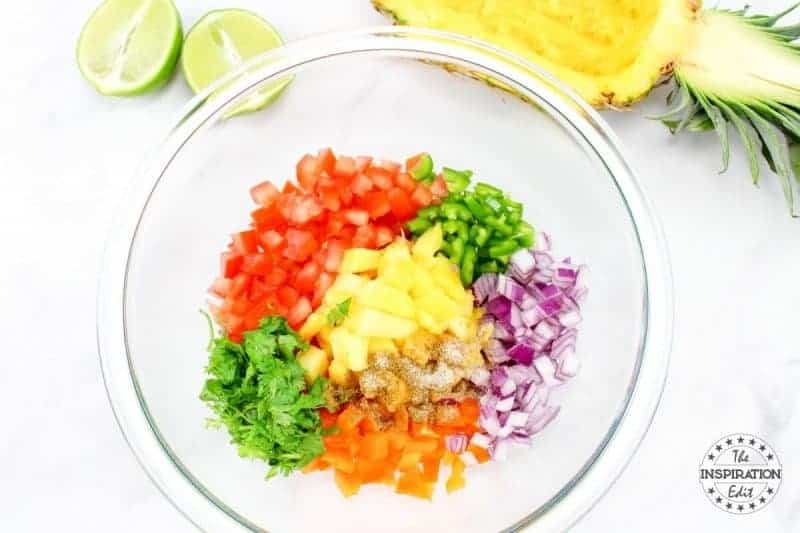 This is a tasty, easy and simple Salsa recipe which would be perfect with fish or chicken as a zero point meal on the Freestlye and flex plans. center. Do this carefully so the stems stay attached to each half. pieces. Put those in the bowl with the pineapple. over the salsa and mix again. 6. 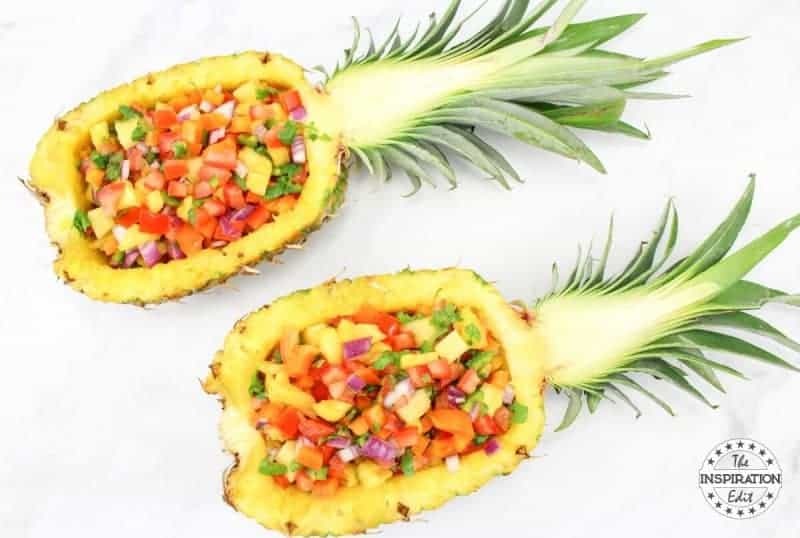 Add salsa to the hollowed-out pineapple halves, then serve with tortilla chips. Enjoy! Be sure to pin this recipe for future reference. Oh man. I am in love with all thing pineapple! I must try this! That pineapple salsa would be great as a side with chicken or fish. YUM! What a fab idea and that would keep it as a zero points meal! 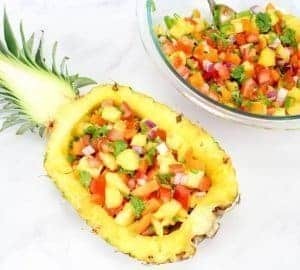 I absolutely love pineapple salsa but have never made my own. Now I will!! 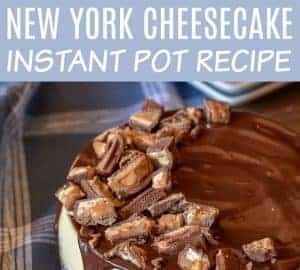 Thank you for the recipe this looks delicious! ooh I hope you love it! I don’t diet but I love this salsa! My other favorite is Mango salsa. Yum! Yes, this can be eaten by anyone, whether your dieting or not… It’s a great recipe. Enjoy!